The AGA 60 means that everyone, wherever they live and whatever kitchen space they have available will be able to find an AGA that fits perfectly. 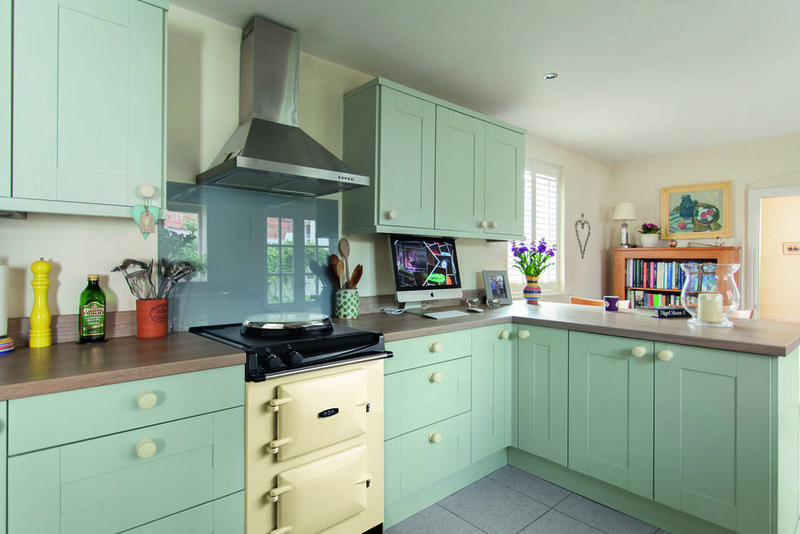 The AGA 60 is everything you would expect from an AGA, but wrapped up in a smaller, more space-friendly package. At just 60cm wide, the same size as a slot-in cooker or a standard kitchen unit, it's perfect for small spaces. And, just like other iconic AGA cookers, it's made from cast iron and employs radiant heat cooking technology, meaning food tastes so much better as all the goodness and moisture is locked in. The new AGA 60 has two ovens, offering roasting, baking and simmering functions, the electric AGA 60 also features a hotplate which enables you to boil, whilst the Gas Hob AGA 60 has four ring burners for every type of hob cooking. Both cookers have an optional timer which allows programmability on the roasting/baking ovens, therefore no need to wait for the cooker to heat up. In the winter you can enjoy the indefinable AGA warmth in the kitchen and in the summer your AGA 60 can be on when you need it and off when you don't. The new AGA 60 offers cast-iron proof that you don't need to live in the country, have a Labrador or be a farmer to enjoy the AGA life. The AGA 60 couldn't be easier to use. With one control knob for the hotplates and another for the ovens, the cooker has been designed with simplicity in mind. The AGA 60's roasting/baking oven can be programmed using an optional Timer similar to that used for controlling a central heating system and can have up to three events programmed per day. This means the oven can be timed to come on and be ready to use when you are. View this video to learn more. Learn more about the 60cm wide, AGA 60. The top oven can be switched between baking and roasting modes. The bottom oven is for simmering. The hotplate can be set either to simmering or boiling. When in boiling mode, the surrounding top plate can be used as an additional area for simmering. When the hotplate is in simmering mode, this outer area can be used as a warming plate, for example to melt chocolate or soften butter. Uniquely and usefully, the top plate is made up of two cast-iron half-moon pieces, which can be removed and put in the dishwasher. The ovens will take about 60 minutes to heat up and the hotplate 8 to 11 minutes. Available in 16 beautiful colours. All new AGA heat-storage range cookers come with a five-year parts and one-year labour warranty. The hotplate operates using a powerful heating element and can be set to either boiling or simmering mode. Around the outside of the actual hotplate is a further useable cooking area. This area can be used to simmer on when the hotplate is set to boil, and as a warming plate when the hotplate is in simmering mode. When set to boiling mode the hotplate reaches temperature in around 11 minutes from cold, while the simmering mode reaches temperature in around 8 minutes. Using the control knob on the far left of the top plate, the top oven can be set to roasting, baking or the off setting. The roasting and baking settings can be achieved from cold in around 60 minutes. From the baking setting, the oven can be switched up to full heat for roasting in again; around 40 minutes. The simmering oven will be up to full temperature in around 40 minutes. Roasting oven - The roasting oven grills, roasts and bakes bread beautifully. Baking oven - A moderate oven for baking cakes and biscuits cooking fish, lasagne or a shepherd's pie. And cooking sweet and savoury dishes together is no problem as the flavours do not mix. Simmering oven - The simmering oven is ideal for slow cooking, allowing flavours to develop and making even the toughest meats tender. The AGA 60 couldn't be easier to use. With four control knobs to control each individual burner and another for the ovens, the cooker has been designed with simplicity in mind. The AGA 60's roasting/baking oven can be programmed using an optional Timer similar to that used for controlling a central heating system and can have up to three events programmed per day. This means the oven can be timed to come on and be ready to use when you are. The heat on the gas hob of the 60 is regulated by means of a rotary control dial, one per burner. The burners are ignited when the dial is turned in the same manner as on other conventional cooker models. All zones feature a flame failure device for peace of mind which automatically turns off the gas supply in the event that the flame extinguishes. The Burners run on natural gas. If you are interested in knowing more about AGA cookers why not attend one of our demonstration held in our Showroom. AGA demonstrations are perfect for potential owners as they give a great insight into what AGA's are all about. To learn more please visit our Events & Demonstration page for more information. Black, Cream, Pewter, Dark Blue, Pistachio, Heather, Aubergine, Pearl Ashes, White, Duck Egg Blue, Dartmouth Blue, Blush, Dove, Linen, Slate, Salcombe Blue.